In association with Concerts SA and Luthuli Museum, iSupport Music Business is bringing the KZN Heritage Ensemble featuring Mbuso Khoza and Mike del Ferro (NL) to KwaDukuza Town Hall on January 7. 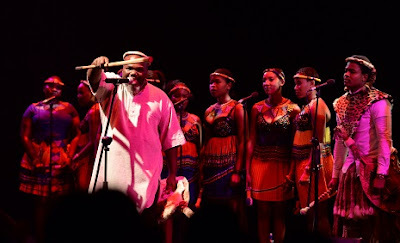 The KZN Heritage Ensemble was formed in 2016 by Mbuso Khoza; a prize-winning vocalist, songwriter and composer from Eshowe, after six years of intensive research on the style of music known as Amahubo. The Eshowe-born award-winning vocalist and songwriter is taking the audience back to the time where it all began. This project seeks to educate both young and old about amaHubo, the spoken word, which is a very popular art in the Zulu culture. Khoza aims to orchestrate and pave a way for generations to come. AmaHubo songs are performed at traditional Zulu weddings, in war, at funerals of homestead heads and chiefs, as well as in other major traditional ceremonies involving a clan, a region and sometimes the whole Zulu ‘nation. Older generations refer to amahubo songs as the songs of the old people or ‘amagama amadlozi’, that is the songs of the ancestors. Knowledge and performance of amaHubo songs form an integral part of traditional Zulu culture. KZN Heritage Ensemble project seeks to educate and revive amaHubo songs. AmaHubo date as far back as the Shaka era, Shaka during his consolidation years assigned at least one iHubo song to each regiment. Each regiment would sub- sequent be identified by its iHubo song. Khoza himself will feature as part of the choir, his music is referred to as a delicate mix of deep traditional Zulu music infused with Jazz elements. This particular sound separates him from his peers, with an ability to reach down to long-gone memories. His world yet reaches beyond this world. The choir will also feature world-renowned pianist Mike del Ferro, who is travelling from The Netherlands to record with the choir. Del Ferro started playing classical piano and after falling in love with Jazz he pursued his studies on Jazz and received a Master in Contemporary Music at the Amsterdam Conservatory. The host of this event, The Luthuli Museum, is a national cultural institution charged with conserving, upholding, promoting and propagating the life, values, philosophies and legacy of the late Chief Albert Luthuli. This concert closes off the year 2017 that marked 50 Years since Chief Albert Luthuli died on 21 July 1967 and aims to look forward to the programs the Museum plans to offer in 2018. The concert will take place on January 7, 2018, at 14h00 at the KwaDukuza Town Hall, King Shaka Street. Tickets R20 at the door.